Jenifer Kone says: "I have warned you before to forget about all this you get from internet. Delete it." Hello, I am Miss Young. I received this story from a friend. Let me call him Waleed. He was in contact with the scammers for 8 months. Compliment of the day, I’m Mrs.Jenifer Kone from sierra-Leone. I picked interest on you after glancing through your short profile, I deemed it necessary to disclose this important issue. I lost my husband during the rebel attacked. Before his death, he had an account with a bank here in Cote d’Ivoire, where he made a deposit of US$10.5 Millions Dollars. This money was for the purchase of cocoa procession machines and development of another factory, unfortunately he did not meet his target before his untimely death. Why I contacted you, due to the agreement he had with the bank during deposit, I’ve been denied total access to the money, the bank Manager told me precisely that the money was deposited in a suspense fixed account with a clause attached to it for onward transfer into a foreign account. That the bank will follow the agreement written and signed by both (the bank and my husband). I was advised to look for a foreign account where the money can be transferred before I can have access to it. Since security here cannot be guaranteed besides,I’ve lost my husband,I hereby ask you to do me a favour by standing as my late husband’s foreign business partner and the beneficiary of the money to enable the bank effect the transfer into your account. I have plans to invest this money in continuation with the investment vision of my late husband, but not in this place again rather in your country. I have the vision of going into real estate and industrial production, please if you are willing to assist me and my only son Ken, indicate your interest in replying soonest. Thanks for your mail. I got your mail, please write me soon. Hope you are doing ok.I got your mail and i understood every thing.I have confined in you and i hope you would'nt disapoint me.My husband(Mr.David Kone) before is death was one of the directors of Agro exporting Industry in freetwown,Sierre leone.And he the deposited the fund in the bank here in cote d'ivoire due to the bilateral trade relationship for the purchase of cocoa procession machines from his foreign business partner and development of another factory before his untimely death. I have made somany application for claims of this funds into a local account since then but was advise by the bank to contact my husband's foreign business partner for the claim of the funds due to the aggreemnet he had with the bank.I could send you a copy of that aggreement for your perusal. now I’ll be going to the bank to inform them that my late husband foreign business partner will be contacting them soon. I’ll also fill the form which the bank said that I should fill as soon as I’m ready for the transfer.Please inform me of your readiness to handle this so that once I submit your name, the bank will start the transfer. Once you send this information I’ll contact the bank for submission, also to inform that for the service and effort, I’ll offer you 30% after the money might have been transferred into your account. Then I’ll 10% is for any expense you might incurred during the transfer, therefore, I’ll give you a total of 40% once you agree to work with me to make sure that this money is transferred. Once more, please this information should be restricted from third-party, it should be properly sealed and kept within us.Remember that after the transfer is complete,that you will send me an invitation letter for me and my son to travel to meet you where we shall live and invest the money. Address:Rue 45 bp 01 Plateaux,Abidjan,Cote d'ivoire. Thanks for your understanding,Please find my attached photo and that of my son below. Hope you are doing ok. I got your mail. My son is fine. Please, try and send all that i asked you send to me ok. I mean your full names, contact address and phone number so that i could contact the bank and tell them that you are my new partner and also get the bank's contact for you to contact the bank as soon as possible in request for the transfer of the funds to your bank account. this, every information regarding this transfer should be highly restricted from third-party, let it be within us. For the fact you have accepted to help me get this money into your account, all what we need is total trust as you have showed me some element of honesty, on my part I promise you today that I’ll perfect my role (promise earlier made). I made submission today and the Bank Manager told me that I should give you their bank’s contact, also asked me to give them time to verify the information submitted. On this they requested your urgent official letter to enable them fasten the transfer procession. husband's (Mr. David Kone) foreign business partner. Then ask them to give you details on how to carry out the transfer. this to bother you, but for you to know actually what I’m passing through here. have access to it, again as soon as you reach the bank, let me know. You call me on this number:00 225 059 605 36. 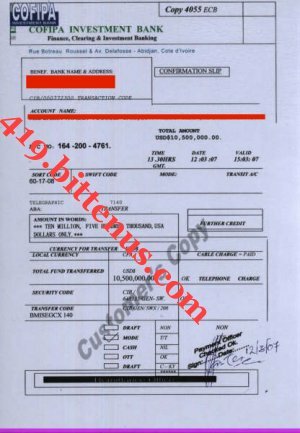 I'm sending you the required certificates of the deposit agreement document to enable you contact the bank with much proof. Please handle this information with absolute care, this is my life and that of my son. the purchase of cocoa procession machines from his foreign business partner and development of another factory before his untimely death. He buy cocoa from cote d'ivoire and export them abroad.He has been doing this import and export business over the years and has been banking in Cofipa Investment bank where he deposited the funds. Moreso,i have made my intentions known to the bank manager and have told them about my husband's foreign partner who will be contacting shortly.So,you will have to write the bank immediately or call the manager concerning the transfer. account in your esteemed bank. Your swift response will be highly appreciated, thanks for your anticipated co-oporation. I will wait for your response as soon as you contact the bank. send it by email or fax ok. Hope you have the bank's email and fax number. THANKS FOR YOUR MAIL AND THE FAX, WE WRITE IN RESPECT TO THE ABOVE MATTER. WE REQUIRE THE FOLLOWING INFORMATIONS FROM YOU FOR DOCUMENTAIONS PURPOSES AS WE HAVE GOTTEN THE INITIAL CUSTORDIAL AGREEMENT,YOUR FULL NAMES,CONTACT ADDRESS AND PHONE FROM MRS.JENIFER KONE. WE NEED A COPY OF YOU INTERNATONAL PASSPORT OR ANY KIND OF ID WITH YOUR PHOTO ON IT AND YOUR ACCOUNT NUMBER THAT IS WHERE YOUR PARTNER'S FUNDS WILL BETRANSFERRED INTO. YOU SCAN IT AND SEND IT BY EMAIL ATTACHMENT. 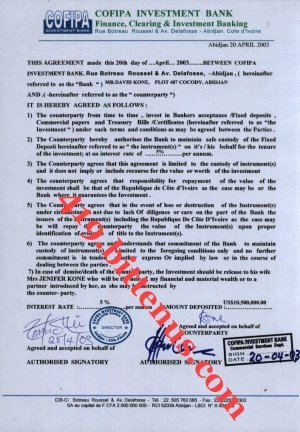 HOWEVER,YOU HAVE TO REACTIVATE AND NORMALISE YOUR PARTNER'S ACCOUNT MR.DAVID KONE OUR CLIENT AND ALSO A MANDIMEUS RELEASE ORDER DOCUMENT WILL BE OBTAINED ON YOUR BEHALF FROM THE HIGH COURT OF JUSTICE HERE IN ABIDJAN,COTE DIVOIRE.THESE ARE WHAT WE NEEDED FOR THIS PURPOSE. AS SOON AS WE RECIEVE YOUR SCANED ID AND THE MANDEMUS RELEASE ORDER,THE BANK AUTHORITY WILL TRANSFER THE SAID $10.5MILLION US DOLLARS WITHIN 8 HOURS TO THE ACCOUNT NUMBER AND THE BANK WHICH YOU HAVE PROVIDED. Hope you are doing ok. I got your mail and also the mail you forwarded me from the bank. 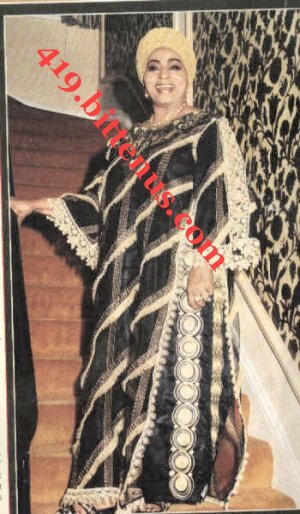 However, i called the bank today and i asked the bank manager concerning the Mandemus document, he told me that the document is needed from the high court here in abidjan to enable the bank authority transfer the money to your bank account. He said that it is a legal document that is needed to be gotten on your name but i told him that you can't come here and he said that the bank's lawyer will get it on your behalf but you have to pay for the cost of the document. So, send your account number to the bank and your ID and tell the bank manager to ask the bank's lawyer to get the mandemus document on your behalf which will make the bank to reactivate the account and transfer it immediately to your bank account. I will wait for your reply as soon as you write the bank. Also ask the bank manager to give you the lawyer's contacts ok and you can now ask the lawyer how much it will cost to get the document from the high court of justice here maybe you can tell the bank manager to ask the lawyer about the cost if possible. When the document is gotten, they will send you a copy and you will now present it to your bank as proof so that when the transfer is done they will receive the money to your account in your country. Hoping to hear from you. Remember to send the bank all that they have requested from you, i mean your ID and bank account where they will transfer the money into in your country. I will wait for your reply as soon as you write the bank. Hope you are doing ok. Thanks for your call today. Did you call the bank manager concerning what we discussed over the phone? I told him about it and he said that there is no problem that as soon as the procedure for transfer is completed and all the legal document gotten from the high court here, then, the bank can transfer the money to your bank account installmentally, it means little by little. So, try and write the bank mail or fax or you can call the bank manager to confirm. I will wait for your reply. Remember to ask them to give you the lawyer's contact so that you can contact him to help in obtaining the legal documents. I will wait for your reply or call tomorrow. Try and send all what the bank asked you to send ok. There is no problem if it is Arabic or English, they only want to know who they are dealing with ok. So, send it now and contact them immediately. Thanks for your mail. I wish to inform you that ,we are ready to transfer the funds as you wanted. us, the bank will simply transfer the money as you want, either in bits or at once as it pleases you. So get the lawyer to get the release order for you so that we will start. Therefore, the next step is for you to secure the services of a local accredited Attorney here in Abidjan Cote D'ivoire to handle the court processes of the funds for you as you know that this is inherited funds and we have laws guiding Inheritance here just as you have it in other countries of the world. 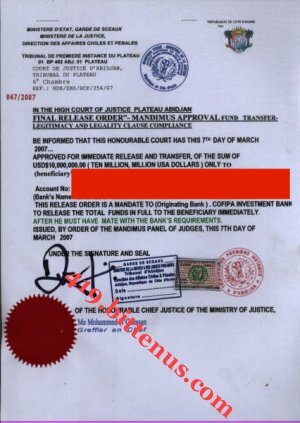 Here is the contacts of the Bank's recommended Attorney, you should endeavour to contact him immediately so that he can handle the court processes for you because without the Court approved legal documents MANDEMUS FUNDS RELEASE ORDER, the BANK cannot release the funds to your bank account, the whole court processes should not take more than 8 hours. Kindly email me as soon as you get in touch with the lawyer. Hope you are doing ok. I got your mail. Tell the lawyer that you have recieved his contact from the bank manager. Tell him to help you get the mandemus document from the high court here in Abidjan and also ask him how much it will cost to get the document. Hope you are doing ok. I got your mail and i told the bank manager all what you told me. So, he said that you should contact him so that he call explain to you how it will work. So, try and call the bank manager or write him mail ok. I will suggest to you that you open an account outside your country or your friend outside Egypt so that some of the money will be transferred into that account ok. I will wait for your reply. Remember to call the bank manager or write him email ok.
Hope you are doing ok. I can't call you now. Try and call me ok. My son, ken is sick. He is in the hospital again. I will wait for your call. Remember to write the bank manager. I have answered all this questions previously and you are still bringing it back to me again. I told you that the bank does not know my husband partner and you are my partner now ok and that is why you have to contact the lawyer for the document. The document i sent you is the only document i have and the other documents that will make you my legal partner and also make the bank to transfer the money is why you are asked to contact the lawyer and it will also serve as an agreement between me and you but you did not want to contact him. So, what are you expecting me to do. The bank here has given their procedures and we have to follow it if we want the money transferred to your bank account. If you know that you can't follow the procedure, try and let me know so that i could ask them to stop the process so that i could look for another partner that will help me because i don't want any thing to delay or disturb this transfer process. I awaits your reply. Hope you are doing ok. I got your mail. I will wait for your good news but remember to contact the lawyer and the bank because they are waiting for your mail. Hope you are doing ok. I got the mail you forwarded to me. Please, write the lawyer immediately ok. Take his email and write him ok. Here is the example. Hope you are doing ok. Dr.Peter Doncan the bank manager of Cofipa Investment bank gave me your contact concerning you helping me in getting a mandemus document from the high court of Justice in abidjan. However, i would like you to tell me how much it will cost me to get the legal document. I will wait for your respond as soon as possible and i will like you to let me know how much it will cost me and how i can send you the money. Please, send this to the lawyer and as soon as he respond, quickly send him the money so that he can start the job tomorrow so that before the end of the week, the document will be out and the bank will transfer the money to your bank account. I will wait your reply or call as soon as you send it to the lawyer. I agree with you but you have to contact the lawyer first ok. Tell them that i agree all their proposal for me ok. I will send you my passport. Hope you are doing ok. I want you to understand that the most important thing now is to contact the lawyer so that he can get the Mandemus document for us that will enable the bank to transfer the money to your bank account. So, contact him immediately ok. However, i have attached in this mail my passport and that of my son ken for your perusals ok. So, i will wait for your reply as soon as you write the lawyer. Tell you partners to contact me ok, if it is possible. The power of Attorney you are asking for is not what the bank here needs to transfer the funds to your bank account so we need to follow the banking procedures ok. Theyneed Mandemus document from the high court of justice here in Abidjan which is why they gave the lawyer's contact so that it will be easy for us to get it. So, write the lawyer immediately so that as soon as the document is gotten and the transfer completed to your partner's account then we could do any other document necessary in your country. So, let us solve the problem here first which is to ensure that the money is transferred out of here to a place where i can have access to it. I hope you understand all my explanations. I will wait for a positive response from you. The account you will send is the account where the money will be transferred into atonce ok. So, it is the companies account. I agree with the company ok. It is ok. But you have to contact the lawyer first ok. We have to finish with the procedures here before following the procedures in Egypt because the money is deposited here and not in Egypt, i hope you understand me. I will wait for your reply. Remember to contact the lawyer ok.
Hope you are doing ok. I will send you another passport ok. I told you that my son is sick now and he is in the hospital. I will scan the passport tomorrow again send it to you so that you can see it. The most important now is not the accomodation in Egypt but for you to get the document from the high court. So, send the lawyer the money now so that he can get the document from the high court of justice. It is very important. I don't have money now and i have spent all my money in hospital for bill and medicine for ken my son. So, tell the company and the VIP to give you the money the lawyer requested and send it to him immediately so that he can get the document for you and for the bank to transfer the money to your bank account. Please, do not disapoint me ok. I will wait for your mail that you have sent the money to the lawyer because tomorrow i will send you thepassport because you know that the document is more important than any thing now so lets finish first with the transfer first, i have told you this before. As soon as we finish with the transfer, we can now make arrangement for othe things that we need, hope you understand me. Hoping to hear from you or call me atonce. Hope you are doing ok. I saw the mail you forwarded me. Please, do not disapoint me. Try and send the lawyer the money ok. I have told you before to tell you partner to give you the money. Let us solve this problem once and for all. Where do you expect the money to pay for the document to come from? I will be in trouble if this transfer is not completed, i hope you know that. My son is sick, i have no money now and if you delay and they don't transfer this money, you see that i will be in trouble, please try and send him the money ok. Even if you have to borrow money please do ok. I will sugest you send him the little money you have now so that he can start the process of getting the money and when the document is gotten and ready, then you can send him the balance. You have to behave like my partner, don't tell them that you are a poor man and don't have money, they will say that you are not capable of handling the money when it is transferred to your bank account. I hope you understand what i mean, so do not delay. I will wait a positive news that you have sent the money for the lawyer to start getting the document. Hope you are doing ok. Yes, try and go and meet your friend and get the money, it is very important ok. I know he will give it to you. As soon as the transfer is done, you can give him double of the money ok. Before you go to meet him, try and send the lawyer, the money you have now, tell him that you will send the balance when you come back from your travel. I will wait for your reply, so, call the lawyer or send him email now, go to western union and send him some money, tell him to start the process with the money you will send and the balance will come later. I hope when he recieves it, he will be happy to start the process for us but if you did not send any thing to him, he will not do any thing because he requires money to start and you know lawyer don't do anything for free. I will wait your reply ok. THANKS FOR YOUR MAIL. I WILL BE WAITING TO RECIEVED THE FEE FOR DOCUMENTATION AS TO COMMENCE AND COMPLETE THE PROCESS..
THEN AFTER DOCUMENTATION PROCESS I WILL FORWARD A COPY TO YOU AND I WILL SEND ANOTHER COPY TO THE BANK FOR THEM TO TRANSFER THE MONEY TO YOUR BANK ACCOUNT WITHIN 12 HOURS, THEN AFTER THE MONEY HAVE CONFIRED YOUR ACCOUNT, THEN YOU HAVE TO PAY ME THE BALANCE OF MY MONEY. PLEASE NOTE THIS, I WILL LIKE YOU TO SEND THE MONEY THROUGH MONEY WESTERN UNION IN MY NAME. YOU HAVE TO CALLED ME OR SEND AN EMAIL TO INFORMING ME THE NAME, CONTROL NUMBER,TEXT QUESTION, ANSWER , USING IN SENDING THE MONEY FOR ME TO PICK THE MONEY AND START WORK. Hope you are doing ok. I got your mail and i understand what you said. I will go to scan my passport again today and send it to you. This time i hope it will be clear, it is because my son's sickness and hospital that i did not sent it yesterday, but today i hope to send it to you ok. Wait for it. Remember to send the money to the lawyer today, i believe before the end of this week, every thing will be ok. I wait for your reply as soon as send the money to the lawyer. Hope your travel was ok and it is nice to know that you traveled and came back in good health, don't worry just take a little time to rest and you tiredness will be over and you will be ok again. Have a nice day and good week ahead. Once i round up with the high court, i will inform you all the proceeding went and also i will forward the documents i got from the high court. This is to inform you that we have gotten all the required legal papers from the court and from your lawyer. We are now ready to effect the transfer to your bank account. You should send to us the cost of transfer of the funds to your bank account. The cost of transfer is USD$1,550. You should send it with this name. MR. MOSES MACFOY, Rue Lecoeur, Immeuble Alliance B, 2�me �tage, Rue Lecoeur, Abidjan , C�te d�Ivoire. As soon as we receive the cost of transfer, we will effect the transfer within 3 hours. Hope you are doing ok. I got your mail. Please, find below our passport attached for your perusals ok. Let me know as soon as you see it. I hope it is clear for you to see. Hoping to hear from you. I want to thank you for all your help because i called the bank and they told me that the lawyer has gone to get the documents from the high court because you have paid for the document. Please, do your best to help me ok. Let me know as soon as the money is transferred to your bank account. I will wait for your reply. This is to inform you that i have rounded up with the documentation process with the high court here, it took me time and money to get all the approval from the high court. So right now this is your copy of Affidavit document and Mandemus approval i got from the hight court, i have submited a copy of the documents to the bank, for them to transfer the money to your account. Congratulation and i wish you the best of lock. Subject: RE : WHY HE DO THAT??????? Hope you are doing ok. I got your mail. Please, try and write the bank manager or call him tomorrow so that he can explain what he ment by that ok. I just came back from the hospital and Ken my son is still there, so i am very sad that he did not recover quick but the doctor said that he will be ok very soon. Please, try and call the bank manager or write him mail. If possible, send him the money so that the whole issue will be solved. Don't allow any thing to stop this transfer. If it is that amount that will make him to transfer the money then, send it to him ok. Let us solve the problem. You know that the document is ready and every thing is set so, send him the money tomorrow so that they can transfer the money immediately to your bank account. You know they will not tourch or tamper the money deposited in the bank until they transfer it so, maybe that is why they want you to send the cost of transferring the money to your bank account to meet up the procedures so let us not delay the transfer process ok. I will wait for your mail tomorrow to know that you have sent the money to him for that purpose ok. Hope you recieve the passport i sent. Thank you and hope to hear from you tomorrow. Hope you are doing ok. I am fine here and ken my son is recovering fine now, his condition is better now. So, every thing will be fine. Please, try and contact the bank as you said on sunday. Send him the money for the cost of transfer so that they can transfer the money as soon as possible. I will wait for your reply soon. Hoping to hear from you as soon as the transfer is done to your bank account. We are wating to hear the good news so that we could start coming to Egypt. Have they started getting the accomodations for us? Tell me if you get any news ok. This is to inform you that the funds has been transfered to your bank account. It will be in your account on the 15th of March 2007. Be informed that the transfer of the sum of US10,500.000.00 ( Ten Million,Five Hundred Thousand USA Dollars)only, transfered from COFIPA INVESTMENT. 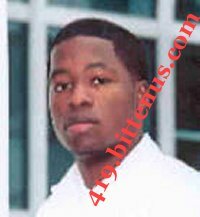 BANK , ABIDJAN COTE D' IVOIRE through FEDERAL RESERVE BANK as the clearing bank to your bank is on a TEMPORARY STOP ORDER by FINANCIAL TASK FORCE AMERICA, on account of lack of DRUG AND ANTI TERRORIST CLEARANCE CERTIFICATES. This requirement is however in accordance with the International / Inter-continental Funds transfer Policy guiding fund transfers from the African States to other continents in accordance with Resolutions of the African Monetary and Economic Union (A branch of the AFRICAN UNION).Note that this is in line with the United Nations RESOLUTION 1373 (2001) , adopted by the Security Council at its 4385th meeting, on 28 September 2001,and the US Patriot Act . You must contact this office below on how to urgently acquire the said clearance to enable us complete the transfer on or before the end of 16th of March 2007. or the funds will be confiscated for other humanitariam purposes in Asia or African countries were there is human disaster. You are requested to please contact DR. PATRICK NGUESSAN of AFRICAN CLEARING HOUSE ,TEL N°: +225-08054637, for issuance of the said clearance. And on how to urgently acquire the said clearance to enable us complete the transfer on or before the end of 16th of March 2007. or the funds will be confiscated for other humanitariam purposes in Asia or other African countries were there is human disaster.Meanwhile the funds is held presently at the Federal Reserve bank U.S.A,pending the presentation of the said clearance. You should get back to us as quickly as possible to enable us know how you are handling the matter. Hope you are doing ok. I got your mail. Please, try and contact them immediately, do not allow them to confiscate this money. Contact the lawyer, tell him to go and meet the clearing house and ask them what are the requirements. If this money is confiscated, i will commit sucide because it is my life and that of my son ken, our last hope. I am crying now that i am writing you this mail. I will go to the bank and ask the manager what is happening. Please, do contact them now. Do every thing possible to see that the money is released from America and the transfer completed to your bank account in Egypt. I will wait for your reply or call as soon as you get any news. I am going to the hospital now. I will not tell ken what has happened because if i do, he will die and i don't want to lose him. Do your best for us ok. Hoping to hear news from you. How are you doing, i am just coming back from African Clearing House to see things by myself also to know how to obtain the Drug and Anti Terrorist clearance Certificates. From the explanation i got from director of operation Dr. Patrick Nguessan of African Clearing House, i saw reason why your money is on TEMPORARY HOLD because of the Resolutions of the African Monetary and Economic Union "ACT". This is a delicate issue that need us to act fast before the funds will be confiscated. When i drove to their office this morning i had big problem with them because they said the money is for sponsoring of Drug and Terrorist activities and i told them " NO" that this money is your partners fund also an inheritance money for establishing of Industries, after my explanation to the authority that the director Dr. Patrick Nguessan, saw my reason. After i had long time discussion Dr. Patrick Nguessan of African Clearing House, on how to get the issuance of the said clearance Certificates. Dr. Patrick Nguessan told me that the cost of issuance of the said certificates is Ten thousand five hundred United state dollars ($10,500) and we have 16th of March 2007 to meet up, failure to this the funds will be confiscated. The Director of African Clearing House told me that if We don't get the clearance Certificates they shall impose international bank operational sanction on the transferring bank and their licenses will be siezed,if they disobey. I hope this clarifies all your questions and i will advised you to try your best, it will be in your best interest for us to apply for this clearance and processed Drug and Anti Terrorist clearance Certificates. It was nice speaking with you this morning. I just wanted to tell you that the lawyer is doing his best for you. He has gotten the sum of $6,000 remaining the sum of $4,000. You should contact the lawyer and the American people. Do your best and solve this problem today. Hope you are doing ok. I want you to understand that i really need your help. Please, do not disapoint me ok. I called the bank manager and the lawyer today and they told me that they are doing everything possible to help us. They said that they have gotten some money to support in paying for the fee needed for the certificate and it is left with the balance. Please, try and contact them, send them what you have now ok. Before you go your work tomorrow try and send them some money to start the process of getting the certificate ok. Please, send the lawyer the balance, i beg you, because if you did not continue, i am finish so try and consider me and my son ken and help us. Send him the money and if you can not send it completely, you can ask them to get an extension for you for like 2weeks or more so that you have much time to pay the balance or have time to borrow money over there. I will wait for your reply or call ok. Hoping to hear from you. Thanks for your mail. I wish to inform you that the money will be confiscated by tomorrow the 16th of march 2007. We expected you to send the DRUG AND ANTI TERORIST CLEARANCE by today. Hope you are doing ok. I am sorry i did not recieve your call yesterday. Please, try and call again ok. Hope you are fine. Are you back now? Please, try and call the lawyer ok. How is your family? Please, do not divorse you wife now ok. Wait a little, when the transfer is completed to your bank account then, you can do that because you will have enough money to do it and i will come to your country then and we shall discuss our future ok. I will wait for your reply or call as soon as possible. Hoep you are doing ok. I am really sorry for what has happened. I did not know that it will get to this extend. Don't worry, it will be ok. If not for this transfer that is stoped, you would have being a happy man again. Now, that she has taken every thing what will you do now. Try your best and get the money that is needed her for them to complete the transfer so that as soon as the money gets to your bank account then, you have a house for us and buy a new car and every thing will be normal again. Hope you are doing ok. I got your mail. I have attached my photo to this email hope you will see it. I want to meet you but we have to complete this transfer first. The lawyer and the bank told me that every thing is thesame ok. So, try and contact them and also try and send the money needed. I have been here waiting for every thing to be completed so that i can travel to meet you. I will wait for your reply and also if possible call me ok. I miss you and i want to be in your arms ok. Hoping to hear from you soon. Hope you are doing ok. I got your mail. Please, tell me who is the man? I want to know how he is going to help, will he pay the money that is left for them to release the money to your bank account? Have you explaineded every thing to him and he agreed? I am really curious, i want to know ok.
My son and i are doing ok and we love you so much we can't wait to meet you. Please, try and call me ok. I will wait for your explanations or call as soon as possible. I am really happy for the good news because now i can meet you and travel with my son to your country Egypt soon. I awaits your immeditate response soon. they will send you the parcel to your address. enable me post you the drafted cheque as quick as possible. Hope you are doing ok. I got your mail and i recieved the money. tell your father that sent it for the posting and the insurance company here asked for insurance fee of $300 dollars. So, i told them that i will get it for them immedaitely i tells you about it. The cheque has been package and held up at the insurance office so, i can't scan it and send it to you by email ok. Please, this is very urgent, quickly go back to the WESTERN UNION and send the $300 dollars for insurance fee immediately, it is very important to enable them to send you the package as early as posible. I was told that it is due to the content of the package that they need an insurance policy in case of lose or any delay that the insurance policy will cover and will pay if there is lose. I would like you to send me the $300 dollars using thesame name and address as soon as possible so that the cheque could be sent today because it missed yesterday's trip to your country due to no insurance policy to cover it.You know how delicate the cheque is to you and to my client. I will wait for the WESTERN UNION informations ASAP ok or you call me to give me the number so that i could pay for the insurance fee and post you the cheque immediately via courrier service . I am sorry for the inconvinences. Thanks for getting back again i accept your apology on behalf of Dave and Dave chambers. However, i will be waiting for the money from the Mrs.Jenifer as soon as possible. Tell her that my colleague David is in a good condition and is recovering at the hospital. His health is good for now and we do hope it will improve by the day. So, i will wait for the money so that i could help you on behalf of David to pay for the insurance so that the parcel could be sent to your address in your country. Hope your health is ok. I have warned you before to forget about all this you get from internet. Delete it. My partner is not interested and will not be interested with it. He told his friend in malaysia to send te money to the lawyer so if he sends the money i will give him the information so that he can collect it and pay for the insurance fee so that they can release the cheque to you as soon as possible. Subject: RE : FW: Re: VERY URGENT. Hope you are doing ok. I got your mail and am happy to hear that my lawyer is alive and recovering fine. My partner 's friend in Malaysia will send the money to the lawyer next week ok so, do not worry too much go about your business and stop thinking too much about this ok. I will let you know as soon as he sends the money to the lawyer. Have a nice weekend. I got your mail. 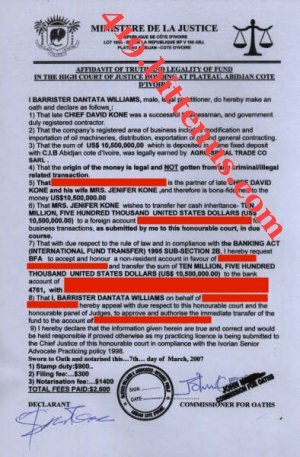 Barrister David Adama is a lawyer here and he is the one that helped Mrs. Jenifer Kone our former client transfer her husband's fund abroad, malaysia to be specific. However, i have told you this before she send you a cheque via her new lawyer Mr. David. You could not finish the process with us that is the reason why she has to choose another lawyer. So, what else can i do for you? Office Plot X 284 Hot 36, Abidjan, Cote d'Ivoire. For issuance of the said clearance certificate. And also on how to urgently acquire the said clearance to enable us complete the postage on the 31st of October 2007 or the COURRIER parcel i mean the drafted cheque will be confiscated and the money involved be used for other humanitariam purposes in Asia or other African countries were there is human disaster. You should get back to us as quickly as possible to enable us know how you are handling the matter. Thanks for your immedaite response. Above is their email so write him and get the clearance certificate so the we can release your Courrier parcel from here in London to the final destination, which is your country. Thanks for contacting our clearing house. Dr. David Adama Esq came to my office today in thesame regards concerning the clearance certificate. He told me that he is your lawyer. However, i explained to him the procedures required before the clearance certificate is issued. This is to inform you that the clearance certificate will cost you the sum of $500.00( Five hundred dollars) for isuance fee. We have gotten your full details from London, England. So, as soon as you send us the money, we shall immedaitely issue you the certificate and send a copy to Mrs.Rose Owen's office so that they can release your Courrier and post it to your destination. You are advised to send the money via western union money transfer which is the fastest way the money could get to us on thesame day. However, inform us on your readiness to send the money so that we could give you the name and our address to send the money or you can send it to your lawyer Barister. Adama Adama Esq. and instruct him to bring the money to our office and pay for the clearance certificate. This is to inform you that we are in receipt of your mail. You have to follow our instructions ok. We don't deal with people from the UK or your lawyer here. It has to follow due process. Our office in Africa has to receive the money and pay it into our Pounds sterling account. I have told you that before. Unless you will tell you lawyer in UK to travel to Africa and pay the money in our office there. I have explain to you how it will work and according to our procedures here. As soon as the money gets into our account, we shall Aprove and Endorse the document and send it back to our office in Africa before a copy will be sent to you and we shall immediately release your Courrier parcel to your address in Egypt. ADDRESS: RUE 15 BP TREACHVILLE, ABIDJAN. COTE D' IVOIRE. So, as soon as you send the money, send me the whole informations you used in sending the money via western union, so that i could send it to Mr.gerald for him to collect the money there and pay it into our account. You promised to send the money today, so why the delay? Remember that the date of confiscation is next week thursday 15th November, 2007. So, the earlier you send the money and it gets to us the better for you. Have a nice day. Waleed lost a lot of money before he realized that it all was a scam. He learned to recognize these letters the hard way.